Rub a side of each slice of bread with a cut side of garlic and brush with oil. 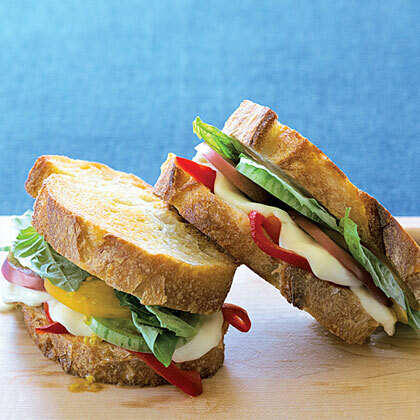 Layer the plain side of half the bread with cheese, tomatoes, and peppers, dividing evenly. Top with remaining bread, garlic side up. Cook 2 sandwiches at a time in a large frying pan over medium-low heat, covered, turning sandwiches once, until golden brown and cheese is melted, 6 minutes. Tuck 4 slices basil into each sandwich. Sprinkle with salt and pepper.